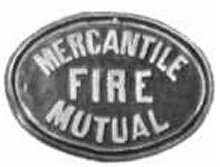 Up until 1890, fires were fought by employees of various insurance companies. A fire mark, like the one below, was attached to a building in order to identify which insurance company they belonged too. 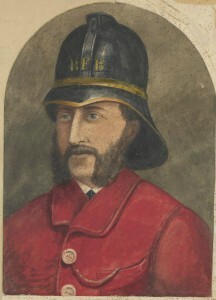 In 1890, and then consolidated in 1958, the Fire Brigades Act was passed through Victorian Parliament. As a result, the Metropolitan Fire Brigade Board (MFBB) and the Country Fire Brigade Board (CFBB) were established. 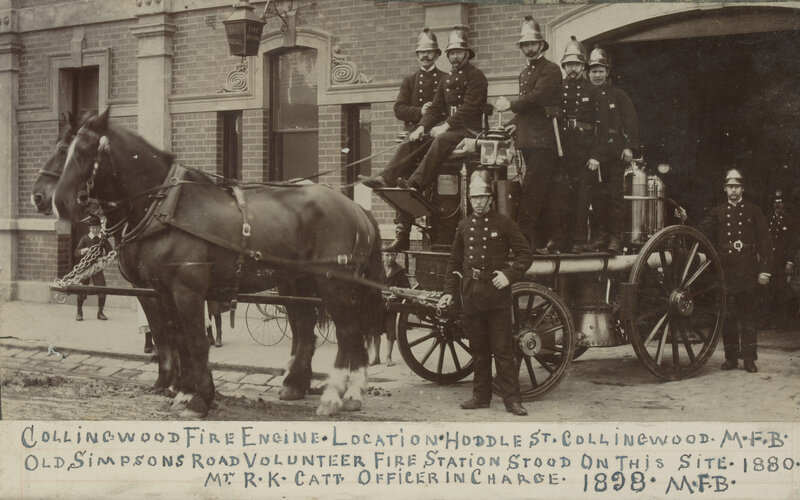 The MFB started in 1891 and used horses to pull the carts, hoses and reels and firemen (women were first inducted in 1988), throughout Melbourne. Street fire alarms were gradually placed on city and suburban street corners and a watch tower at Eastern Hill, which still serves as the MFB headquarters today, gave a 360 degree view over Melbourne. By 1919 the MFB was fully motorised and continued to grow and adjust to a modernising city, adopting breathing apparatus and becoming increasingly involved in road accident rescues. As Victoria expanded and towns were established, volunteer country brigades were formed, the first being at Geelong in 1854. By 1888, there were 100 brigades in Victoria and in 1919 the CFBB provided motor vehicles for several brigades. Modern equipment was vital in coming years as huge fires took homes, land and lives in 1926, 1939 and 1944. As a result the Country Fire Authority (CFA) was established in December 1944. It divided Victoria into regions and appointed Regional Officers who would represent the CFA in country areas. Today the CFA have 1120 brigades and are supported by 59,000 volunteers and 1800 staff, fighting not only fires but floods. 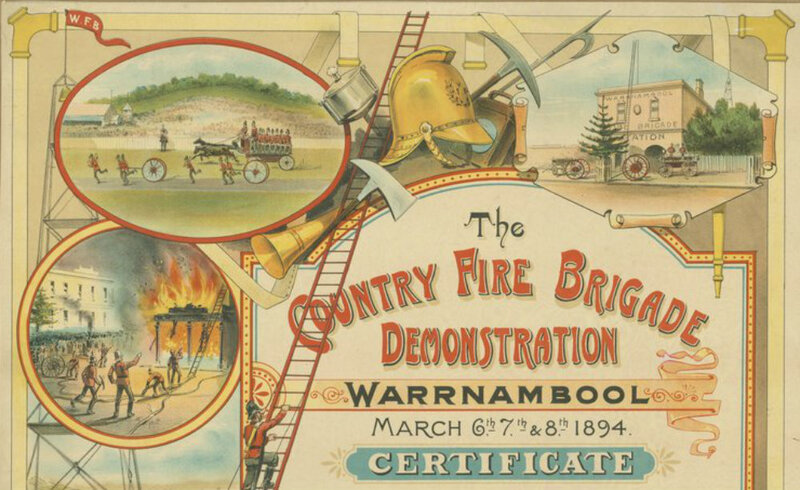 The Library holds many resources about fire fighting in Victoria, which can be accessed in the Library, as well as many images on our website. 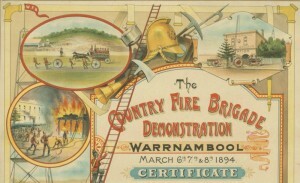 We also have a collection of firemarks on display in the exhibition The changing face of Victoria. For more information on bushfires in Victoria, you can use our research guide. Murray R, White K 1995, State of fire: a history of volunteer fire fighting and the Country Fire Authority in Victoria, HargreenFitzroy, Vic. The following is a direct extract from CFA’s History Timeline in their official website. Thanks for the comment Neil. (p. 121), ‘The Act to establish the Country Fire Authority passed through the Victorian Parliament in two stages on 22 November and 6 December 1944. The Authority was appointed on 19 December 1944. The copyright of the 1995 book is held by the Country Fire Authority. I’m not sure what precisely commenced on 2 April 1945- as I couldn’t find mention of that date in the book.